Happy New Year! I will be a hive mama for Hive 9 of the Stash Bee in 2016, which means I get the pleasure of posting a tutorial for my hive in January. I created a fun block that I call the Plus Banner Block, and I thought I would share the tutorial with you today here on my blog as well. 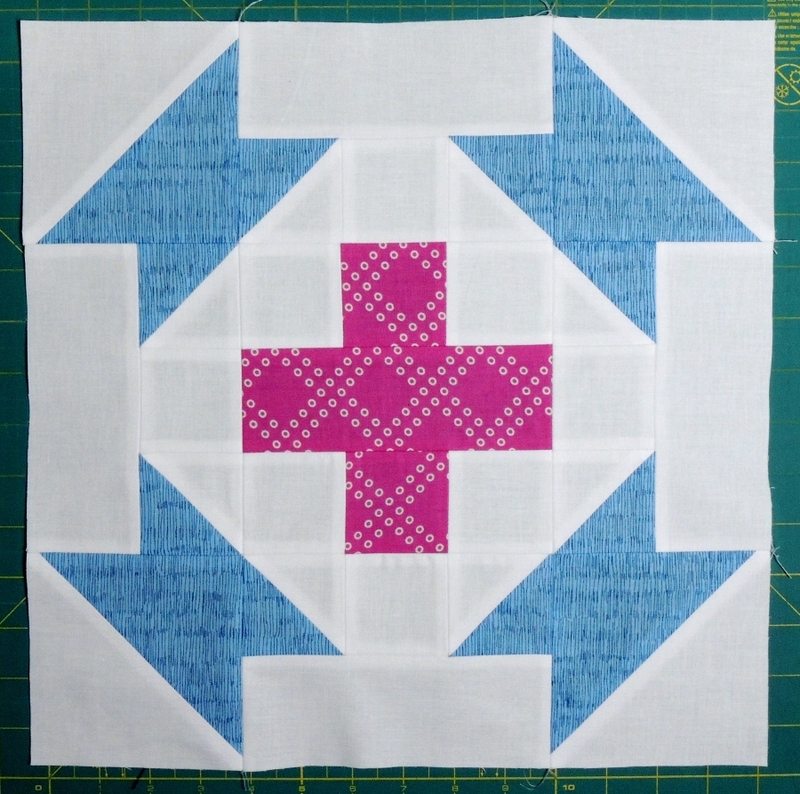 I am super excited about this block, which I am calling the Plus Banner Block. It will be 14 1/2″ square unfinished (14″ square finished in a quilt top). I designed this block when I was on vacation last September, and it is a great block to use to hone your accurate, consistent quarter inch seam allowances. 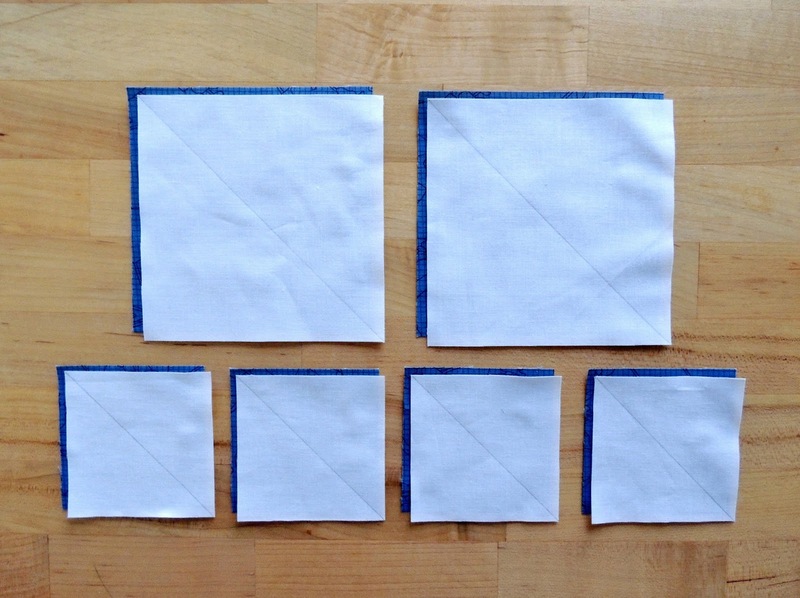 Combine the (2) white and (2) blue 5 1/4″ x 5 1/4″ squares and (4) white and (4) blue 3 1/4″ x 3 1/4″ squares, right sides together, as shown in the photo above. Draw a line corner to corner on the wrong side of each white square. Sew a seam 1/4″ away from both sides of the drawn line. Press to set seam [optional]. Cut along the drawn line. Press seam open. Note about pressing seams for this block: I would prefer if all seams are pressed open. As I mentioned earlier, this block is all about sewing a consistent 1/4″ seam allowance (and not a scant 1/4″ seam). I think that if you piece with a 50wt thread or thinner and press your seams open, this block will come together very precisely. I have a blog post about a tip I use when I plan to press my seams open. 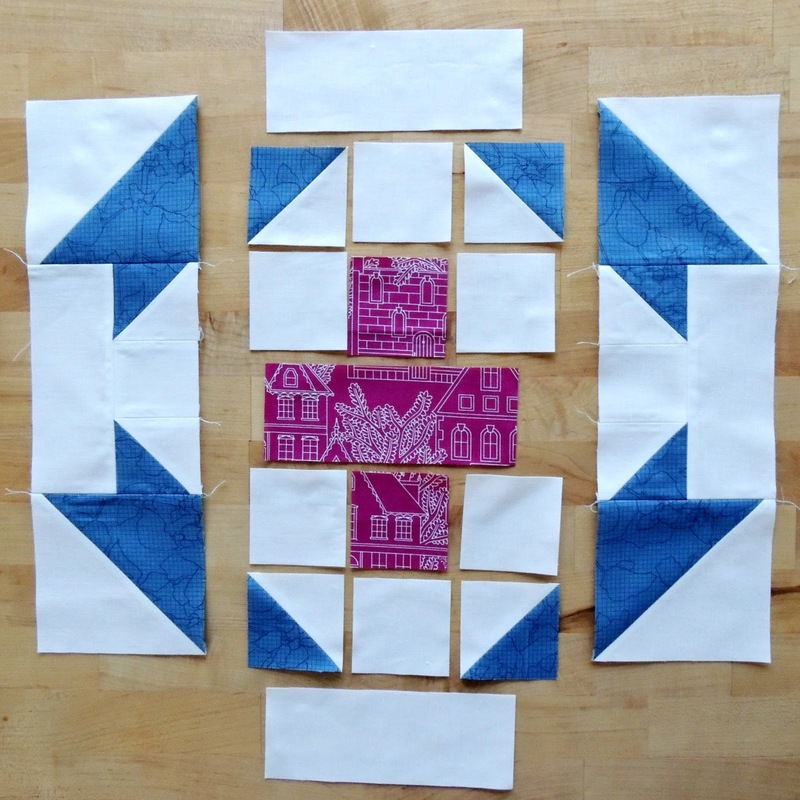 Trim the (4) larger HSTs to 4 1/2″ square and the (8) smaller HSTs to 2 1/2″ square. 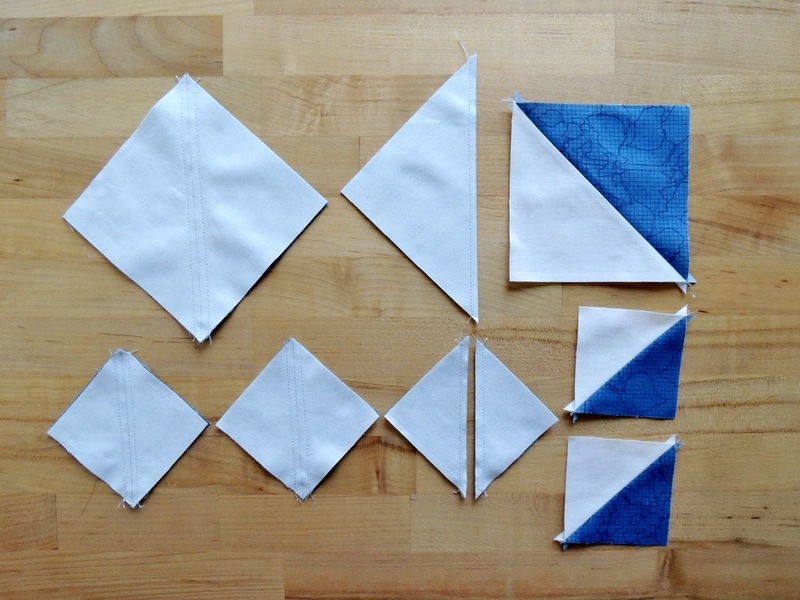 Arrange your blocks as shown in the photograph above, taking care with the orientation of the HSTs. The block will be pieced in 3 columns: the two sides of the block and the center of the block. Sew together a 2 1/2″ square HST, 2 1/2″ square background fabric, and 2 1/2″ square HST to create a 2 1/2″ wide by 6 1/2″ long unit for each side as shown in the photo above. Press seams open. Note that from this step forward, it is important to sew an accurate 1/4″ seam allowance (and not a scant 1/4″ seam allowance). Sew a background fabric 2 1/2″ x 6 1/2″ rectangle to the side of a pieced 2 1/2″ x 6 1/2″ rectangle pieced in the previous step. Refer to photo above for orientation. The pieced unit should measure 4 1/2″ wide x 6 1/2″ tall. Press seam open. 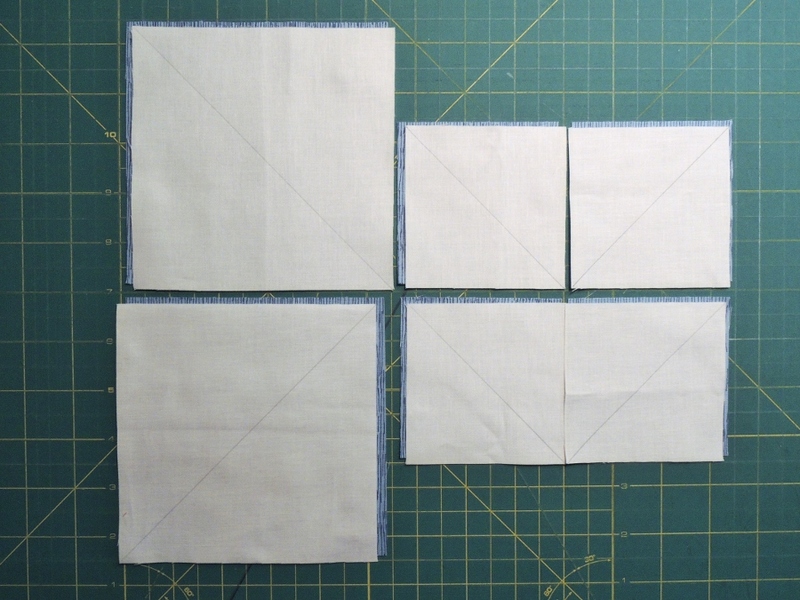 Sew a 4 1/2″ square HST to the top and bottom of the 4 1/2″ x 6 1/2″ rectangle pieced in the previous step. Refer to photo above for orientation. The pieced unit should measure 4 1/2″ wide x 14 1/2″ tall. Press seams open. Piece together the (4) rows of 2 1/2″ squares and HSTs to create (7) 6 1/2″ wide x 2 1/2″ tall rectangles as shown in the photograph above. Press seams open. 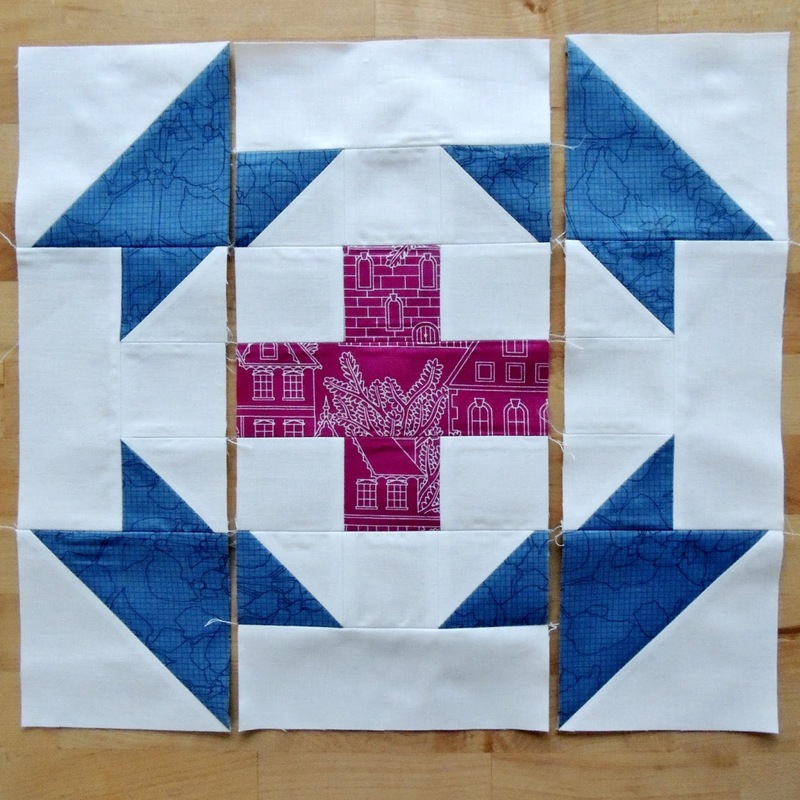 Sew the (7) 6 1/2″ x 2 1/2″ rows together to create a 6 1/2″ wide x 14 1/2″ tall pieced center for the block. Press seams open. 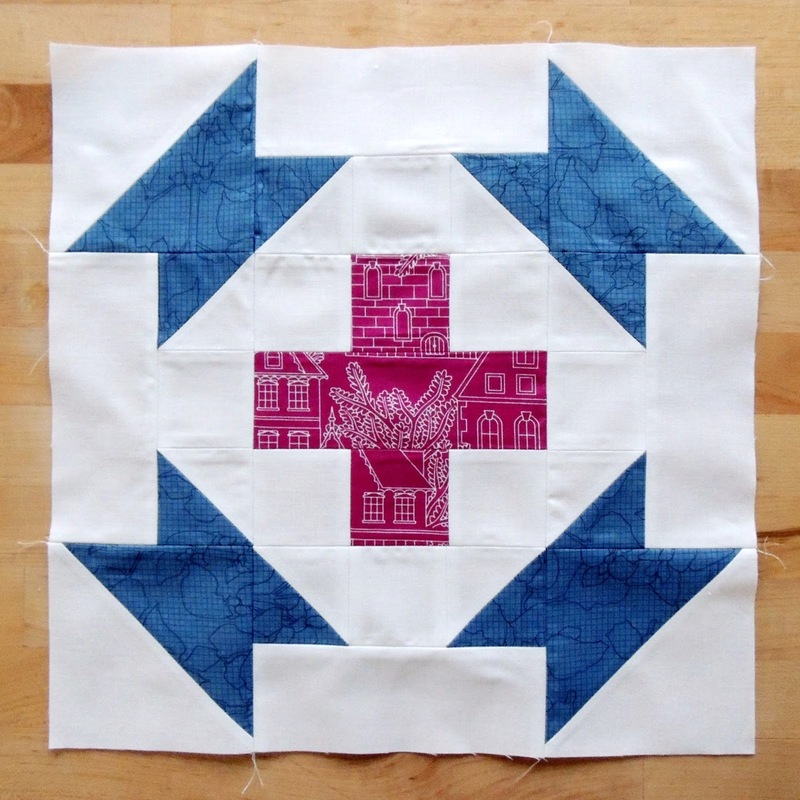 Sew together the (3) column rectangles to create a 14 1/2″ square Plus Banner Block. Press seams open. 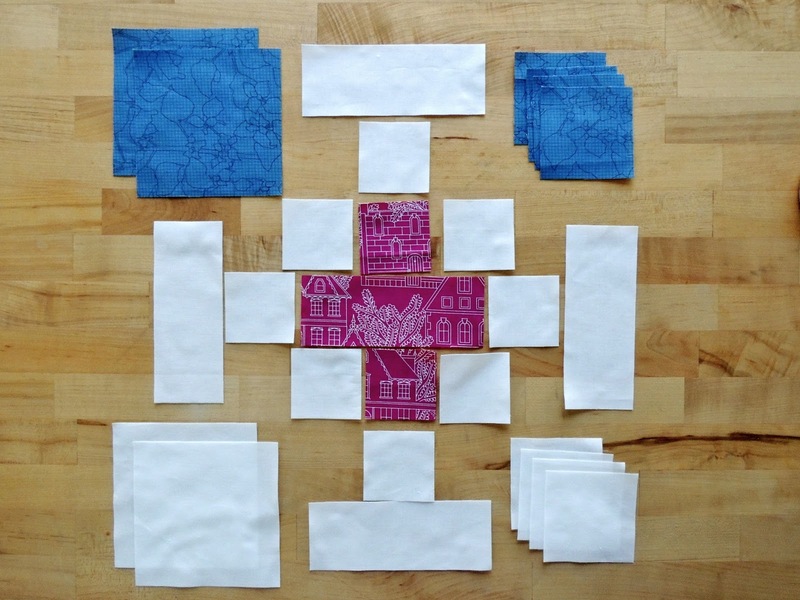 A quick note about directional prints and HSTs. If you choose a very directional print for your blue and if you care to do so, it is a simple matter to get the print to be oriented in the same direction in all your HSTs. 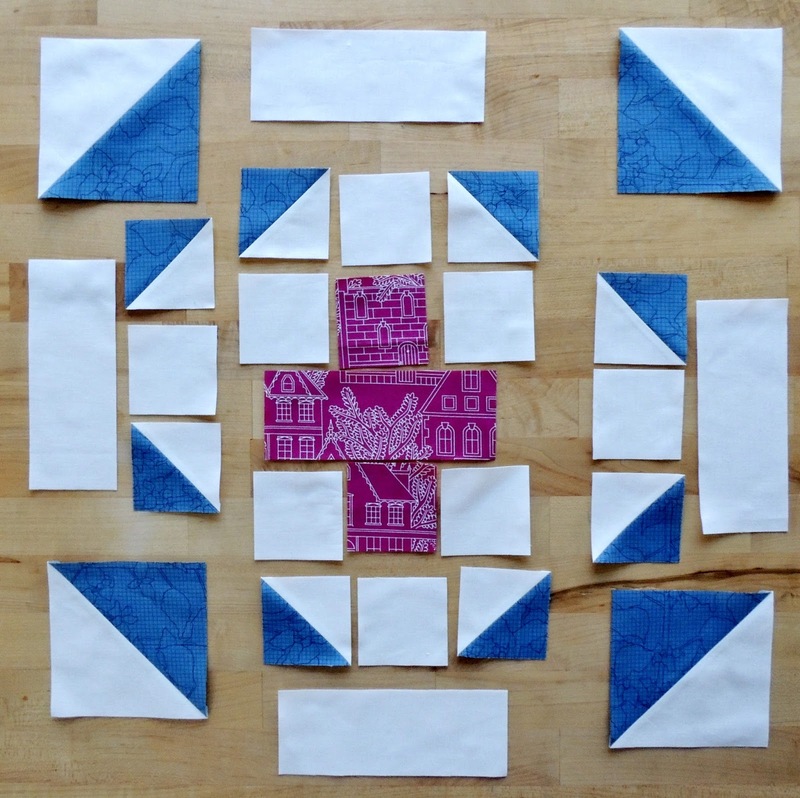 Step 1 – Arrange all your Blue squares with the directional print going in the same direction. 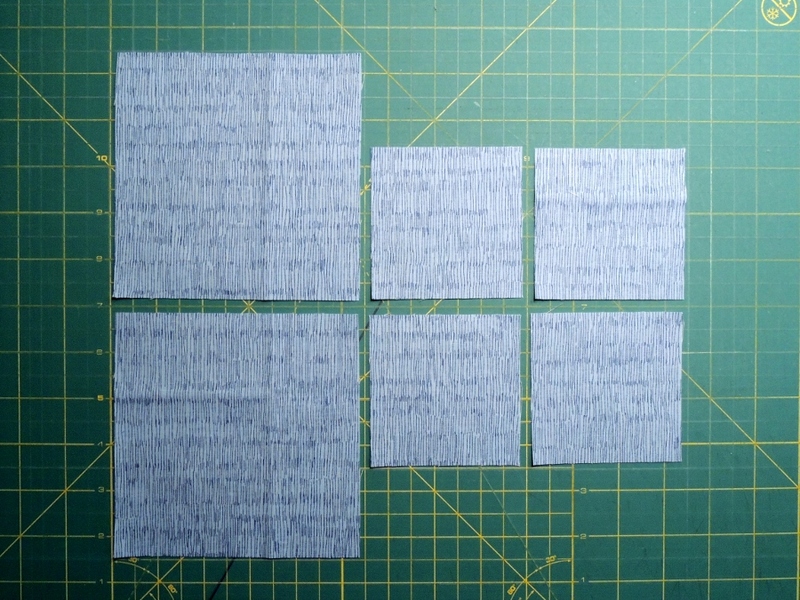 Step 2 – When laying your background fabric on top of the squares (with your pre-marked line corner to corner), place half of the background fabric squares with the line going from the upper left to the lower right and the other half with the line going from the lower left to the upper right. 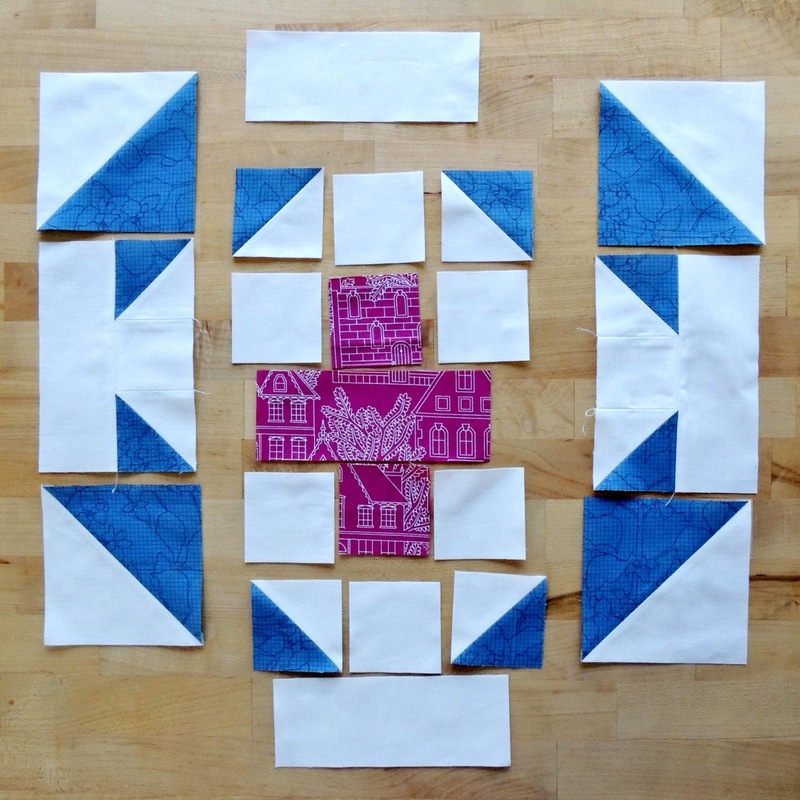 Step 3 – Continue with the earlier piecing instructions, noting that as you place your HSTs for the block layout, you should be able to get all the prints going in the same direction in the block. 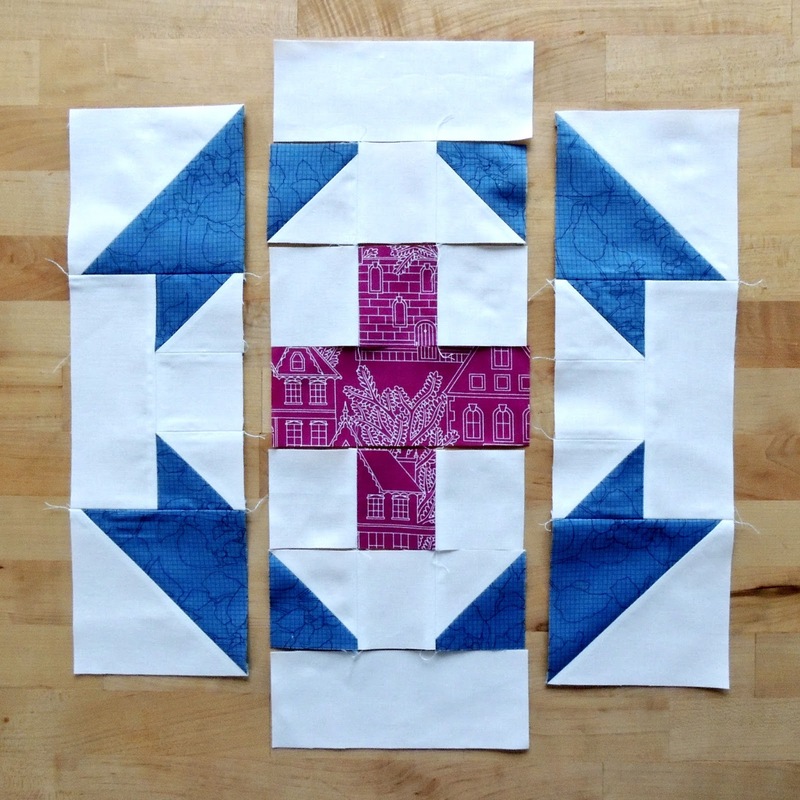 When put together, the Plus Banner Blocks make a fun secondary pattern in a quilt top. If you make a Plus Banner Block or Quilt, I would love to see it! 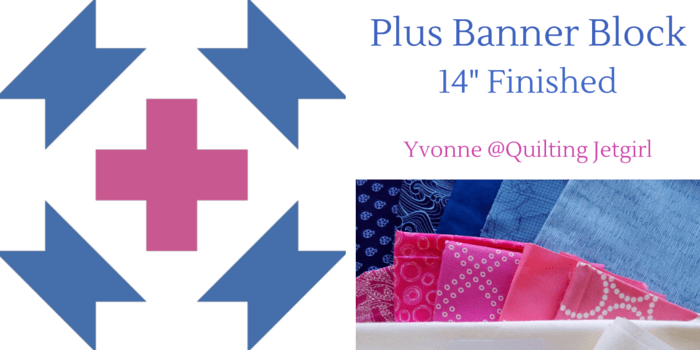 Please tag me (@quiltingjetgirl) and use the hashtags #PlusBannerBlock or #PlusBannerQuilt if you post to Instagram. Or send an email to jetgirl8(at)gmail(dot)com with a photograph or link to a blog post about your quilt! Best plus block, I have seen! Also, it makes me excited to see what my first block will be! I really like this block, a fun twist on the classic plus! The secondary patterns that come from putting the blocks together are interesting, I’m keeping this one in mind for the future. 🙂 Thanks for sharing it! Nice block Yvonne! What a great way to start the New Year! Looking forward to seeing a completed top in this block. You’re going to have a great quilt to put together! Good Morning Yvonne! Plus Happy New Year! This is a spectacular block all by itself with a greatly written tutorial. Add the final pictorial of a possible whole quilt and it is incredible! Once again, you have achieved amazing results that will be so sensational in so many fabric varieties! Thank you for designing this unique individual block and tutorial with us. I know that at some point I will be creating this beauty; but first things first. I have several unfinished quilt projects that must be completed before any new projects are started. Which is really a bummer after seeing this! I hope that you have a wonderful creative day! That’s so nice of you to share the tutorial for your block. I love the secondary pattern that forms when they’re all put together. What an effective block! I hope all your bee mates send you some lovely, accurately pieced blocks. Lovely block Yvonne. Your tutorial is excellent – Just scanning the flow of the pictures shows exactly how the whole block will piece together. Thanks for sharing this! Really like the block you chose for your hive. I think you’re going to get an amazing quilt when it’s all said and done. 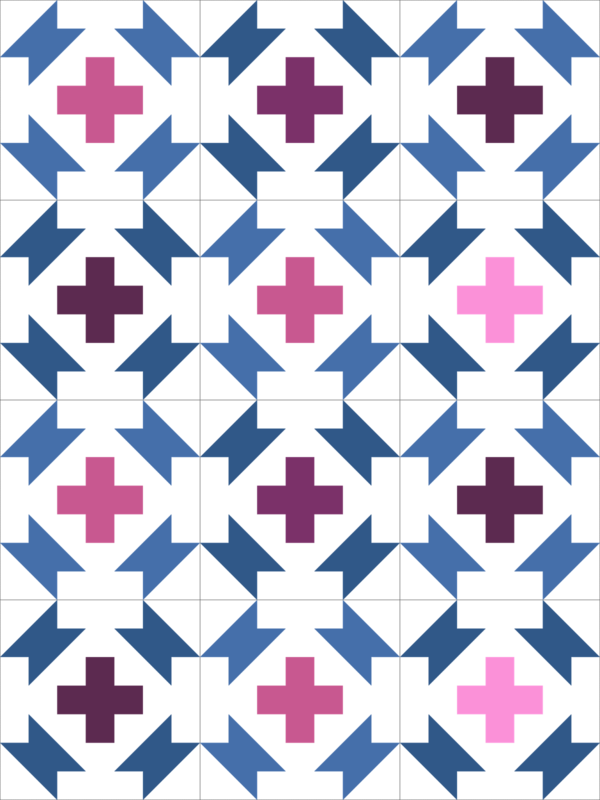 Like the secondary pattern that it creates with the negative space rectangles. Wow, I just came upon your site and I’m quite happy! You are an excellent instructor….great step by step layout instructions! Thank you. I love this block! Thanks for sharing and including tips for directional prints. Great block and tutorial! Thanks! Great block, I really like how you took the time to show how to keep a directional print all lined up! I love this block Yvonne! And thanks for the directional print tip. Now if I can just remember it BEFORE I sew and cut my half square triangles! Great tutorial, Yvonne. Can’t wait to see the Bee Blocks you receive. Your hive members should have fun with this one. This is a great block! I need to get over to Hive 7 and find out what I’m making this month. It’s going to be so fun watching this quilt come together with blocks from everyone! Fantastic block, Yvonne! I couldn’t wait to see a quilt layout so I could see what the secondary pattern would look like, and it doesn’t disappoint! Lovely block, and great tip with the directional print. So the way hives work you’ll get all the blocks sent to you to piece together? Is this going to be a quilt you keep or have you got other plans for it? 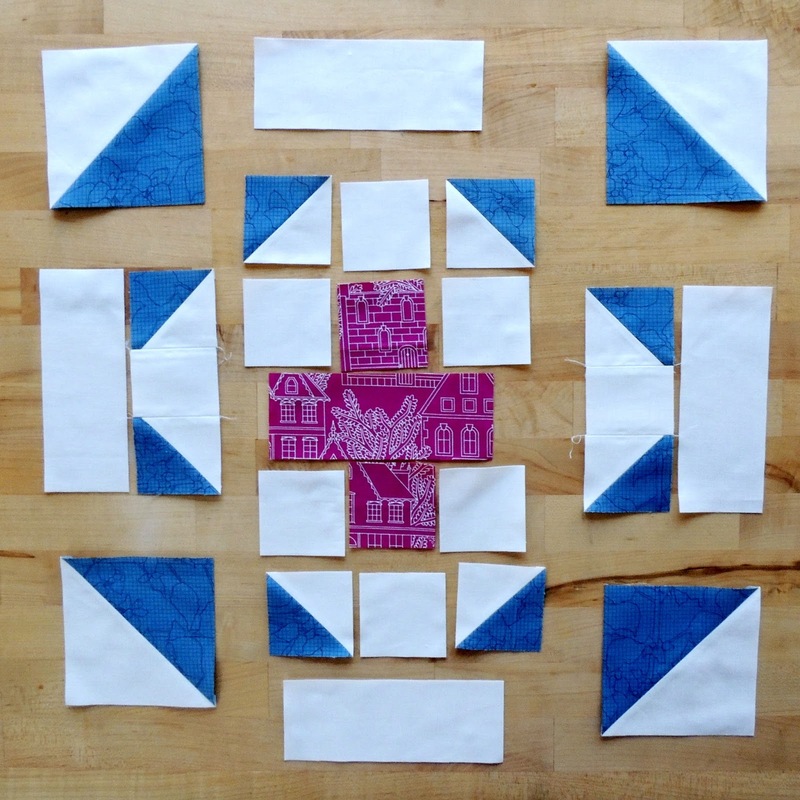 Pingback: Pieced Spider Web Block Tutorial » Tea & Brie || Quilting. Sewing. Knitting. Designing.